If you are a local government official or leader of a community nonprofit organizations, please consider attending one of two grant writing seminars to be held this month. The deadline to register for one of these events is this Friday, Nov. 10. Attendees will learn about assessing grant options and opportunities, building relationships with foundations and funders, maximizing grant search efforts, identifying the components of an effective proposal, understanding how proposals are reviewed, and measuring and showing results. The event is sponsored by Susquehanna River Valley Visitors Bureau and organized by Penn State Cooperative Extension, and Reps. Garth Everett, Lynda Schlegel Culver and me. There is no cost to attend, and lunch will be provided to all attendees. The deadline to register is Nov. 10. Click here to sign up. For additional information, call 570-966-0052 or 570-837-0052. 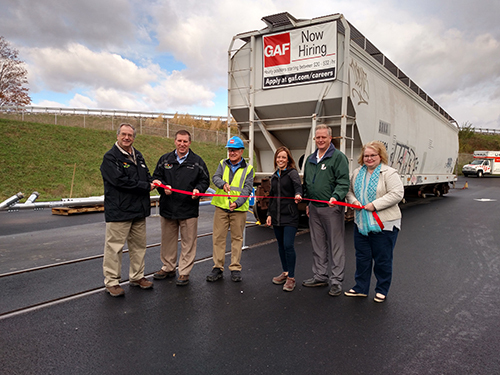 Area officials gathered to mark the inaugural railcar delivery to the new GAF facility in New Columbia on Oct. 30. GAF, a manufacturer of roofing products, purchased the plant in 2016 and has already 26 employees. An additional 26 employees are now being sought. Pictured left to right are: Todd Hunter, Chief Marketing Officer, North Shore Railroad; Joe Kantz, Business and Development Manager, North Shore Railroad; Joe Gregory, Plant Manager, GAF; Miranda Ritter, Human Resources Manager, GAF; Rep. Fred Keller; and Tea Jay Aikey, Central PA Chamber of Commerce. This Saturday, Nov. 11, is Veterans Day. Throughout the weekend, please take a moment to remember and thank the thousands of men and women who have served our country in the U.S. Armed Forces, as well as their family members who support them in their mission to protect our country and our freedoms. Of course, it is important to remember and honor our veterans every day, not just once a year. In the General Assembly, we are working on several initiatives to help our veterans, including one that is now law. Known as the Stolen Valor Law, Act 9 of 2017 makes it a crime for someone to misrepresent military service or honors for the purpose of fraudulently attempting to obtain money, property or other benefits. House Bill 1878 seeks to assist members of the National Guard with employment protection, as the bill would extend current employment protections to Pennsylvania citizens who are members of another state’s National Guard. Currently, the employment protection only applies to members of the Pennsylvania National Guard. The bill is currently in the House Veterans Affairs and Emergency Preparedness Committee and is expected to advance. To recognize the meritorious service of military members, House Bill 165 would create and add the Pennsylvania Medal of Achievement and the Pennsylvania Veterans Service Award to the list of existing medals, badges and awards that are authorized and presented by the governor in the name of the Commonwealth, while House Bill 1762 would add the Honor and Remember Flag to the list of flags authorized to be flown on any public grounds or buildings in the Commonwealth. House Bill 165 passed the House earlier this year, and House Bill 1762 is in the House Veterans Affairs and Emergency Preparedness Committee. Legislation to reform the local tax collection system to reduce instances of fraud has been signed into law. Act 38 of 2017 prohibits checks made payable to a tax collector’s name only. Under the new law, which takes effect Jen. 1, 2018, checks should be made payable to the name of the tax collector along with the office, title or position; or be made out just to the office, title or position and then be deposited into a separate bank account used only for tax money. Previously, the Local Tax Collection Law did not specify how taxes are to be paid, so it was left to individual tax collectors to determine how they want checks made out for the payment of taxes and to what account the tax money was to be deposited. Changing how accounts are set up and how checks are written will give municipalities and taxpayers an added layer of protection by ensuring their tax dollars go where they are intended. The Pennsylvania Game Commission is reminding motorists to slow down and stay alert for deer on the roadways. Deer become more active in the autumn with the lead-up to their fall breeding season, commonly referred to as the “rut.” Autumn also sees a number of people taking part in outdoor activities that might flush deer from forested areas or briar thickets, and deer are more actively feeding to store energy for winter months. Add to this the end of daylight saving time, which results in more traffic between dawn and dusk, and the chances of vehicle accidents with deer increase significantly. In fact, Pennsylvania ranks third nationally in State Farm’s annual report on the likelihood drivers in each state will collide with a deer or other large animal. According to the report, Pennsylvania drivers have a 1-in-63 chance of experiencing a collision with a deer or other large animal – a 6.3 percent increase from 2016. Drivers can reduce their chances of collisions with deer by staying alert and better understanding deer behavior. Be especially alert in “Deer Crossing” areas, and remember deer tend to travel in family groups, so if you see one deer, more are likely coming. To report a dead deer for removal from state roads, motorists can call the Pennsylvania Department of Transportation at 1-800-FIX-ROAD. If the deer is on a locally owned road, contact the appropriate municipality.